Junior big Henry Welsh provided eight points in the first frame off the Crimson bench. 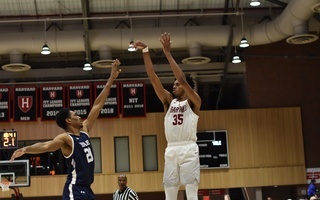 After playing host to an exhilarating double-digit stomp over Yale on Friday night, Lavietes Pavilion felt in some ways, a bit dead and exhausted. 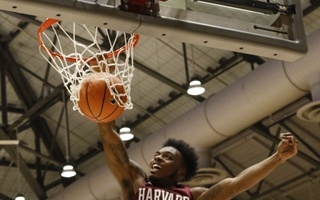 But even without the same fireworks and animosity that characterizes a bout against the Bulldogs, Harvard men’s basketball largely repeated what it had done the night before: a wire-to-wire, balanced-scoring night that saw junior guard Justin Bassey shut down the opposing team’s leading scorer. After Bassey limited highly-touted Yale junior Miye Oni to a 3-of-15 night from the field, the Denver, Colo., native put up another shutdown performance against sophomore guard Desmond Cambridge— who, like Oni, was also drawing attention from NBA scouts with his team-leading 17.9 points per game. Cambridge finished with just four points on 1-of-13 from the field, with eight missed triples. The team’s balanced scoring saw four players in double digits, led by junior guard Bryce Aiken’s 12 points. 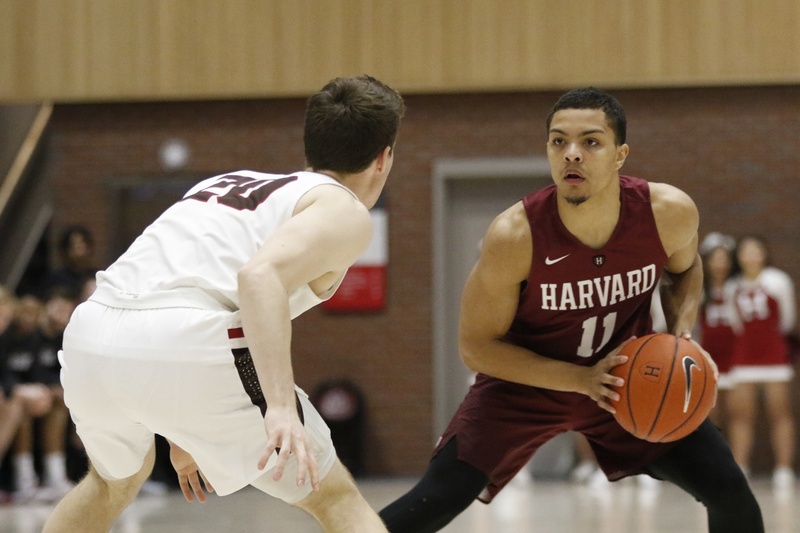 After limited to just 16 minutes against Yale, Aiken was given an expanded role Saturday night and was able to maintain solid spacing with his shifty and fluid ball-handling abilities in the game's 68-47 win. After being limited in minutes against Yale, Aiken saw plenty of action in this contest. After seeing just three minutes of action on Friday night, backup big Henry Welsh provided an instant spark off the bench to start the contest. Starting five Chris Lewis, who had accumulated 35 minutes against Yale, was quickly whistled for two early fouls and hit the bench before the first media timeout. With the Crimson having scored just five points before Welsh took the floor, it was appropriate that the rested big was the one who accelerated the team forward. Welsh earned his first bucket with a spin-around and-one layup, but missed the ensuing free throw. Less than a minute later, the Redondo Beach, Calif, native broke through with another lefty lay-up and-one, but once more could not complete the traditional trey. Finally, Welsh’s misfortune at the line ended, knocking down two at the charity stripe after an inside feed from freshman Noah Kirkwood. 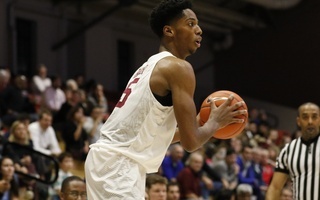 By the time coach Amaker called back Lewis at the halfway point of the first frame, Welsh had tallied a team-high eight points. On the Bears side, it was another bench role player who kept Mike Martin’s side at a stone’s throw from evening the contest. Sophomore guard George Mawanda-Kalema, who had entered the game averaging just 3.1 PPG, was the sole offensive contributor for the Bears for nine minutes in the middle of the frame. Following an and-one drive in by Mawanda-Kalema — his eighth point— at the 9:22 mark, Brown trailed 15-12. The guard would finish the half with 11 points on 4-of-5 shooting. The Crimson broke through for two threes from Bassey and Baker to extend the lead to 21-12 with eight minutes remaining, but both teams went stone cold for three minutes. The final portion of the half saw improved offense performance, but largely for the visitors. Outside of a single Kirkwood conversion attacking the paint and two Aiken free throws, Harvard was scoreless in the final 4:58. The Crimson jumped out to an early 13-point margin to start the game, in part thanks to tenacious defense. Mawenda-Kalema converted another triple, and some more free throw opportunities left the Bears trailing by just six points at halftime. 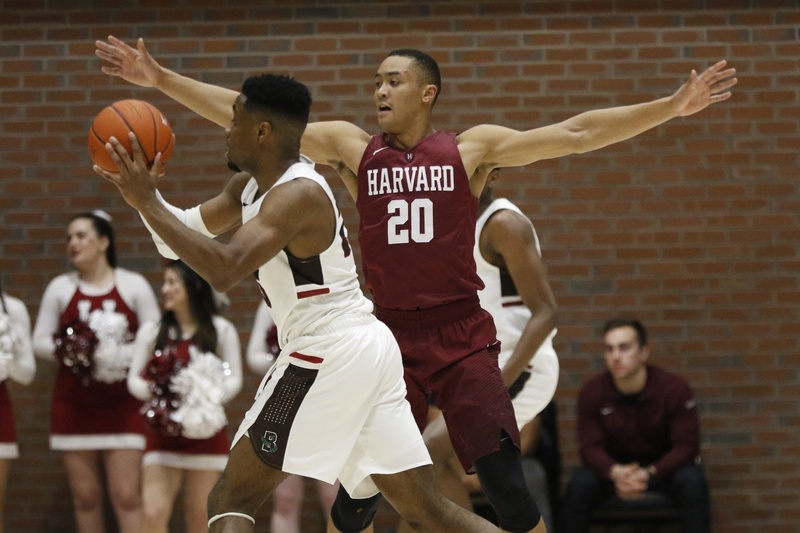 As evident by some of the sluggishness of the frame, Harvard and Brown each racked up 10 turnovers and combined for 20 fouls. 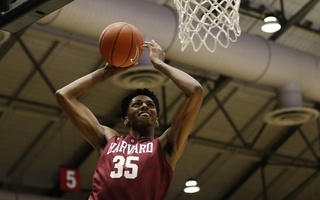 The Crimson kept its negative energy inside the locker room coming out of halftime, as a Bassey triple and Baker uncontested dunk propelled Harvard back into a double-digit lead. However, both teams saw another sequence of languishing play and it would take an Aiken inbounds three and a follow-up triple from junior Zach Hunsaker to open up the scoring stream. Back-to-back layups by Lewis followed by another easy drive-in finish by Bassey brought the Crimson lead to 14, its highest of the night. 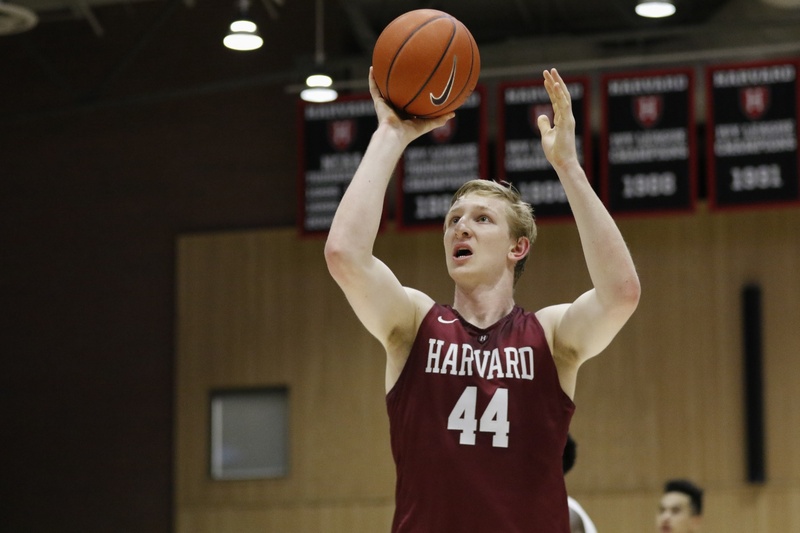 Harvard extended that margin to 17 by the 11-minute mark, with a lone triple from Bears’ senior Obi Okolie interrupting 14 unanswered Harvard points. The Crimson held on to a lead that bordered on 20 points in an otherwise quiet second half. By the end of the contest, one could hear the squeaks and play calls of both sides even from the top of the building. The Bears tried to keep things interesting with a full-court press, but the remainder of the contest ended without too much fanfare. After a star-studded spectator crowd on Friday night — which included a slew of notable basketball figures such as Celtics President of Basketball Operations Danny Ainge, Saturday night saw the appearance of a less discreet but equally noteworthy spectator: former Harvard President Drew Gilpin Faust. Faust’s appearance back in her familiar baseline seat proved to be a good sign for the Crimson, which will have yet another homestand, welcoming Cornell and Columbia next weekend.